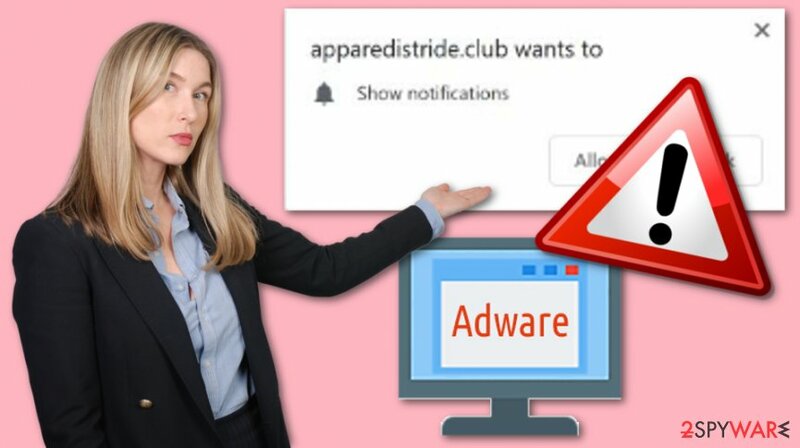 Apparedistride.club is an adware-type application which infiltrates the system via bundled software or suspicious websites. After the secret installation is completed, this rogue app starts performing what it has come for. Firstly, Apparedistride.club virus might start hijacking the web browser in which it was installed. After that, the browser might be filled with questionable content such as browser add-ons and plug-ins. Nevertheless, there is a very big chance to start experiencing redirects to dubious-looking pages and receiving advertisements, some of which might try to promote rogue computer tools and convince the user to visit their original websites. If so, the victim might be tricked to purchase and install completely useless products or services. 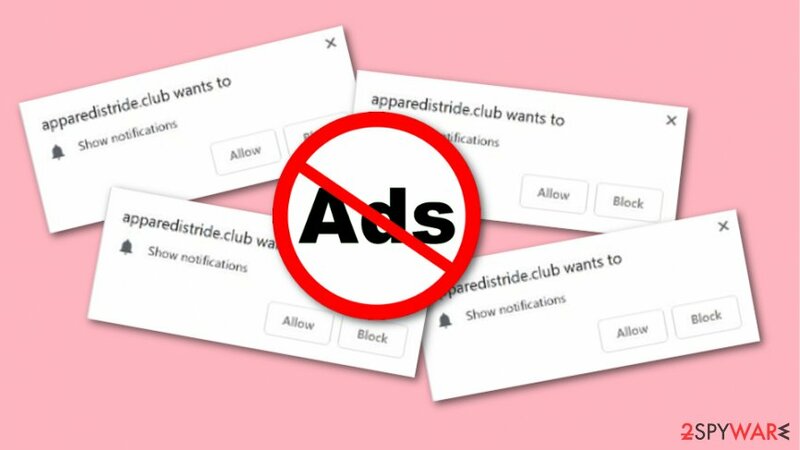 Apparedistride.club pop-up ads might start frequently intruding your browsing activity if you do not take any actions to stop them. If you keep the adware program in the computer system for a long time, there is a big chance you will start experiencing browser crashes and computer slowdowns as frequent advertising might eat your PC's resources. Be careful with Apparedistride.club virus and it's produced ads as they might be misleading. The program might lead you to suspicious-looking websites where you can catch a computer virus infection. Furthermore, notifications might promote useless products, services and try to convince you to purchase them. Rather than keeping this program in your system and facing unwanted consequences, you should perform the Apparedistride.club removal with reputable antimalware tools. However, you can remove Apparedistride.club virus with manual technique also. But we still recommend doing it with specific computer tools as they are created especially for elimination purposes. Moreover, we advise getting rid of all adware-related content from your systems and web browsers. To detect all suspicious programs, use a tool such as Reimage. Once this information is gathered, Apparedistride.club pop-up ads might start providing “useful” offers for the users. Developers use all collected details to create beneficial adverts which seem to offer products or services that should suit the users' needs at first. However, you can never trust these types of notifications as they are not truly created to bring any benefits to the users. They are used to gain income from the cost-per-click marketing technique. According to technology specialists, adware programs are very likely to show up if you are a common visitor of dubious-looking websites. Third-party pages do not fit the security requirements and often have malicious or potentially unwanted content injected somewhere. 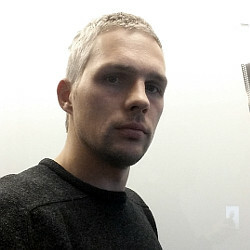 Most commonly, questionable hyperlinks spread computer infections and infected objects. Additionally, another adware distribution technique is known as “bundling”. This deceptive marketing technique allows adding various rogue content straight to regular software packages. If such thing happens, the user downloads the PUP together with the regular program. Good news is that you can avoid this type of secret installation. What you have to do is select the Custom or Advanced installation mode in your web browser settings. This variant will allow you to track down all incoming objects and stop the downloading process whenever you are likely to. Note that, various Quick or Recommended modes do not prevent potentially unwanted programs from downloading to the computer. If you are keen on removing the adware program on your own, take a look at our guide which we have presented below this article. However, performing the Apparedistride.club removal automatically gives you bigger chances that the program will be successfully eliminated. Computer security tools are capable of dealing with such cyber threats in a couple of minutes time. Remove Apparedistride.club virus from your browser too. Check all of the web browsers you have on your computer, including Google Chrome, Mozilla Firefox, Internet Explorer, Microsoft Edge, and Safari. Make sure that you permanently erase all suspicious extensions, add-ons, and plug-ins from each infected web browser. Here, look for Apparedistride.club or any other recently installed suspicious programs. When in the new window, check Delete personal settings and select Reset again to complete Apparedistride.club removal. Once these steps are finished, Apparedistride.club should be removed from your Microsoft Edge browser. Here, select Apparedistride.club and other questionable plugins. Click Remove to delete these entries. Now you will see Reset Firefox to its default state message with Reset Firefox button. Click this button for several times and complete Apparedistride.club removal. Here, select Apparedistride.club and other malicious plugins and select trash icon to delete these entries. Click Reset to confirm this action and complete Apparedistride.club removal. Here, select Extensions and look for Apparedistride.club or other suspicious entries. Click on the Uninstall button to get rid each of them. Now you will see a detailed dialog window filled with reset options. All of those options are usually checked, but you can specify which of them you want to reset. Click the Reset button to complete Apparedistride.club removal process. ^ Plugin. Computer hope. Free computer help since 1998. ^ Jake Frankenfield. Cost Per Click - CPC. Investopedia. Important terms. ^ Bedynet.ru. Bedynet.ru. Spyware news website. This entry was posted on 2019-01-30 at 08:56 and is filed under Adware, Viruses. You can quickly scan the QR code with your mobile device and have Apparedistride.club manual removal instructions right in your pocket. How did you remove Apparedistride.club?